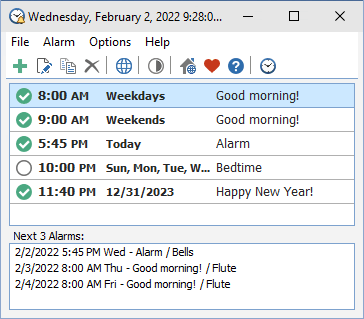 If you need portable alarm clock software for Windows, this is the software you are looking for. Free Alarm Clock Portable supports unlimited number of alarms so that you are not restricted to the number of alarms you can have. Alarms that you set will sound even if computer goes to sleep. The alarm clock can remind you about important events by playing your favorite MP3 music.